This title reads – “Oval 5X4 Magnets – Tips to Use Them for Creating Eligible Advertisements”. It may leave you thinking what are eligible advertisements and ineligible advertisements. Well, there is no such clinical differentiation, which separates eligible advertisements from the ineligible ones. However, you can apply the term eligible for all those campaigns, which can have profound influence on the viewer and power to change buying decisions in the future. Ineligible ones are those, which fail to make an impact on the consciousness, leave alone bringing any sale. 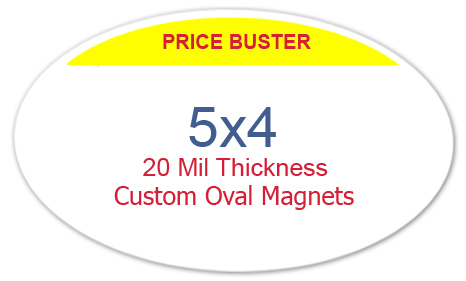 Now you may think why we have chosen 5×4 oval magnets for telling you tip of creating eligible advertisements. You are right; we chose this oval magnet due to its large size, which you can ever rely upon for promoting your brand. Most of these tips stand eligible for use over most other sizes of personalized oval magnets as well as rectangle and square magnets. Perhaps you are well aware of the situation – there are thousands of admirers, but no army of supporters. You should try to covert admirers into supporters by offering them special benefits. Nowadays, businesses are harping on loyalty programs to build an army of supporters. You can borrow an idea from them to create advertisements, which sets people talking. Word of mouth advertising is still one of the biggest sources of marketing. You can send customized full color magnets announcing some lucrative benefits to homes of your regular customers or prospects. Inspire them to tell others why they should join you or buy it from you. For example – Remember the mode of marketing adopted by some well-known cosmetic companies who announced great benefits and discounts on loyalty programs. You do not have to spend on million dollar advertisements to create campaigns that sell. Only you need to be clever with the choice of words while presenting your products and services. Telling them take this for free or save this much percentage on your next purchase sounds very bland. Although people may be temporarily happy with the benefits that it offers, but they do not find it worthy of sharing the news with anyone. Try to pursue your customer by striking their emotional chords. In short and simple words, avoid sounding like a cold-blooded leach trying to vaporize their savings by selling them the product, which they do not want. Do you remember Dolly (the Sheep)? She became the first mammal to be cloned by Ian Wilmut using nuclear transfer of somatic cells the University of Edinburgh. The world was divided into two factions about benefits of cloning and its danger on the human race. Many speculated that human cloning will follow the next and you can one day see clones of Albert Einstein, Martin Luther King, and Mahatma Gandhi roaming around the world. Alas everything fell apart because world grew up to the realization that every clone has its limitations despite imitating the real object. Only clones can imitate an object, they cannot behave like the one. In clear sentences, avoid cloning your campaigns based on some recently successful campaigns. Try to create advertisements, which sound real and genuine and very much yours. You can source oval magnets 5X4 from any reputed online eCommerce store stocking only made in USA magnets because they offer you good quality product and bagful of savings on branding and shipping.